Now mobile devices support good camera and video so you can record all important and memorable moments. SanDisk Extreme micro SDHC makes it easy for you to take photos, carry and save all those moments. 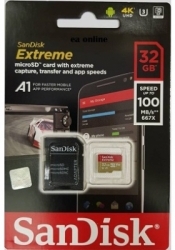 SanDisk Extreme micro SDHC memory is ideal for your smartphone and tablet. Additional memory means you can take more photos and record videos without worrying about lacking a place to store. Class 10 speeds are ideal for uninterrupted 4K Ultra HD video recording with file reading speeds of up to 100MB / s.
The Sandisk Memory Zone application can be downloaded on the Google Play Store, which makes it easy to view, access and backup all your files from your smartphone or table memory. 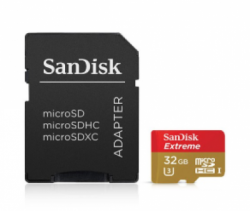 SanDisk Extreme micro SDHC gives you the freedom to store all data on your smartphone or tablet. It is accompanied by an SD adapter, making it easy to copy data between fellow devices that can use SD cards such as cameras or computers.